A couple hours. That’s all it took for Jesse Jackson to publicly express outrage about Little League International’s decision to strip the U.S. Championship from Chicago’s all-black Jackie Robinson West team, and to make it a racial matter. 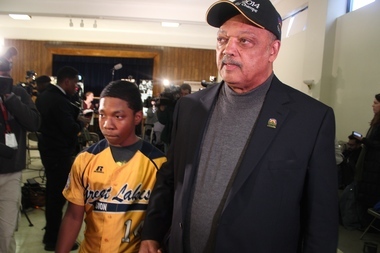 Jesse Jackson at a Feb. 10 press conference spoke out against the decision to strip Jackie Robinson West of its Little League national title. Little League International determined on Wednesday that the Jackie Robinson West Little League and Illinois District 4 Administrator knowingly violated Little League International Rules and Regulations. They did so by placing players, otherwise known as suburban ringers, on their team who did not qualify to play because they lived outside the team’s boundaries. Like the ubiquitous Al Sharpton, Jackson inserted himself into the issue by calling a press conference where he told Little League International to reverse its decision and questioned whether its motivations were racial. “Is this boundaries or race?,” Jackson asked, before threatening legal action if Little League doesn’t rescind it’s decision. Rev. Michael Pfleger, a Roman Catholic priest and social activist in Chicago, who joined Jackson at the press conference, also raised the race issue. “When you’re going over to voter registration and going to birth certificates and doing all this time of hunting and a witch hunt that’s been going on for the last number of months, I can’t help but wonder the question if the same thing would have been done with another team from another place, another race,” Pfleger said. Even a player’s parent, Venisa Green, jumped on the bandwagon. “It is amazing to me that whenever African-Americans exceed the expectations that there is always going to be fault,” she said. Meanwhile, in the true spirit of fun in kid’s sports, Channel 5 NBC Chicago reports that a suburban coach of another Little League Team who raised suspicions about the make-up of Jackie Robinson West said Wednesday that he has received death threats. So I guess the Jackie Robinson West kids have lost more than the U.S. Championship. They’ve lost their innocence. This entry was tagged al sharpton, Jackie Robinson West, jesse Jackson, Little League International, Michael Pfleger, Venisa Green. Bookmark the permalink.